BOSTON - Thursday, February 7, 2019 - Mayor Martin J. Walsh today joined the Office of Economic Development and partners to kickoff the first workshop under the newly-created Economic Development Center. Designed to engage with residents on economic development opportunities around job growth, business development, placemaking and community economic development, the Center will be accessible and convenient to all communities in order to generate economic opportunities for all residents and businesses, and discuss policy and planning in a thoughtful and collaborative manner. "The Economic Development Center is a testament to how the City invests in our people, communities, and businesses, giving people all across the City the opportunity to invest in their future," said Mayor Walsh. "As Boston continues to grow at an incredible rate, we will continue to prioritize economic equity to ensure all Bostonians benefit from Boston's booming economy." The Center kicked off today with a "City Contracting Opportunity Fair," which is part of the "Equity and Inclusion Series" designed to create a network of individuals and businesses to connect with good jobs and public procurement opportunities, and serve as a vehicle to engage directly with diverse communities on equity policy and decision making. An open-house style networking fair that featured 18 city departments and the Commonwealth's Supplier Diversity Office, the event hosted a panel with City procurement liaisons to discuss the bid process, best practices, and success stories to encourage small businesses and minority- and women-owned businesses to seek procurement opportunities as a means to grow capacity and collaborate. "We are working to build an inclusive and equitable Boston, and in order to do that, we are bringing access to jobs, resources, opportunities, and policy development directly to ensure these policies offer real results for the people of Boston," said John F. Barros, Chief of Economic Development. "Today's Equity and Inclusion series kickoff was a great start, and I look forward to engaging with residents and business on in our upcoming series on small business, jobs, and community development." The Economic Development Center will host free workshops year-round, across four series that focus on different sectors and different policy areas including: equity and inclusion, small business, community economic development, and jobs and talent. The Mayor's Office of Economic Development staff and partner organizations will facilitate workshops to engage with residents on policy, connect businesses and entrepreneurs with necessary resources and support organizations, and directly work with individuals to access career advancement trainings, hiring and contracting opportunities, and networking events. The "Pathways to Contracting with the City" will be held at the Bolling Building, with the next workshop scheduled for Wednesday, February 13 at 5 p.m. As more workshop details are confirmed and added to the schedule, all information will be available at boston.gov/economic-center. 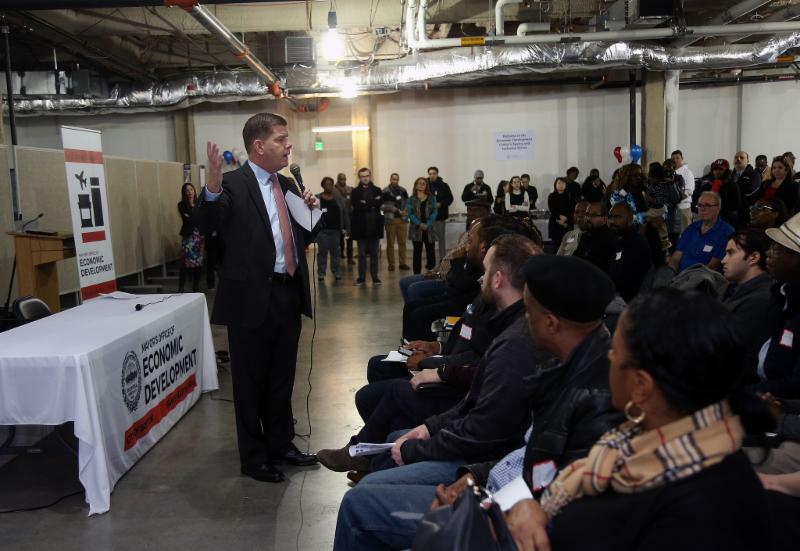 Announced by Mayor Walsh last month during his State of the City address, the Economic Development Center builds on the success of the Small Business Center, first launched as a pop-up pilot by Mayor Walsh in 2017. As a result of the 2016 Citywide Small Business Plan, the Office of Economic Development developed a pop-up series of free workshops in neighborhoods around the City to make services more accessible to small businesses. The 2017-2018 Pilot included a series in Mattapan, East Boston, and Roxbury for about six consecutive weeks each, reaching over 400 individuals. These centers complement Mayor Walsh's overall work to increase access to economic opportunity throughout the City of Boston, including his 15-bill housing security and economic mobility package which promotes equity, opportunity, and resilience through preserving neighborhoods, stabilizing vulnerable households, supporting small businesses, removing barriers that keep people in poverty, providing new pathways to good jobs, and continuing to leverage Boston's prosperity to build a more inclusive and equitable city. In 2014, Mayor Walsh created the Economic Development Cabinet to make Boston an appealing and accessible place for families and businesses to grow and thrive in a way that fosters inclusion, broadens opportunity, and shares prosperity, thereby enhancing the quality of life for all Bostonians.